Arab League Secretary-General Nabil al-Araby held a press conference on Wednesday, September 19, at the Arab League headquarters in Cairo, where he addressed various issues including the ongoing UN General Assembly meetings, the Syrian crisis and the recent anti-Islam film produced in the United States. 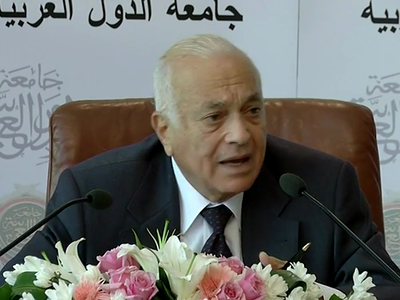 Al-Araby told reporters that the Organization of Islamic Cooperation, the Arab League, the African Union and the European Union are working on reaching an agreement against religious defamation. As for the Syrian issue, Al-Araby detailed the mission of the new UN-AL envoy to Syria Lakhdar Brahimi and his recent visit to Damascus where he met with President Bashar al-Assad, Syrian officials, opposition members, Syrian Free Army members and representatives of civil society organizations. He added that the Egyptian and the Arab League positions are clear on the issue, demanding Al-Assad to step down. Al-Araby stressed in the press conference he held before heading to New York to take part in the UN General Assembly meetings, that the reason for the failure in dealing with the Syrian crisis is the international system established since 1945 and the veto used by China and Russia. He clarified that the Arab League and the United Nations were unable to resolve the Syrian crisis due to the non-cooperation of Al-Assad and his regime and their rejection of all previous initiatives over the past few months.